If you are looking for some quality horror flicks to watch on the 13th look no further. The MFF crew have compiled a superb list of horror films to enjoy. You should be able to have a great horror night with these options. Dead Snow– Norwegian skiers + Nazi Zombies= a fun gore filled night. Once this film gets rolling it becomes a roller coaster on top of an avalanche. Attack the Block– English Hoodies battle angry wolf/bear/gorilla aliens. This movie is a fun time and will make you speak with an English accent for two weeks. Devil–Better than it should be. This is a film that manages to be fun and scary while avoiding excessive gore. Fun claustrophobic stuff. 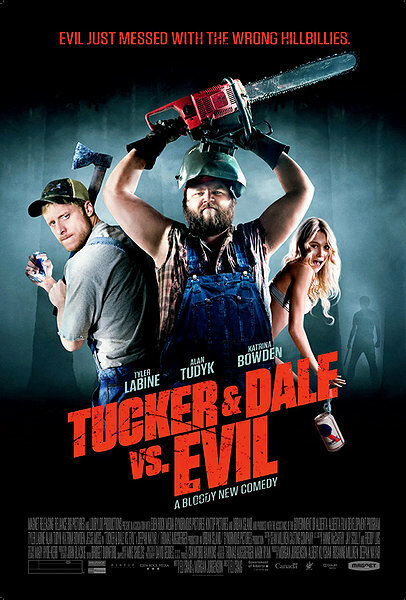 Tucker and Dale Vs. Evil–Not horror. However, it is a fun hybrid that provides a whole lot of laughs and creativity. SUPPORT THIS FILM! Session 9–A daytime ghost story with smart characters and a neat ending. It is amazing how things become much scarier when the people involved are not dumb. Insidious–Freaky visuals, creepy moments and a tiny budget. My girlfriend and I loved every minute of this film. The visuals, acting and humor are all top-notch. 28 Days Later-The beginning scene is crazy intense. I was jumping out of my seat while covering my eyes. Incredible score and music as well. Shaun of the Dead– A fantastic comedy/horror hybrid. If you haven’t watch this go buy it NOW! Behind the Mask: The Rise of Leslie Vernon: Another awesome mockumentary hybrid with creativeness aplenty. Characters don’t get much more original than Leslie Vernon. If it came down to you watching one of these films I’d have to go with Tucker and Dale. I know it is not a horror flick but it is so much fun and it deserves the support. Drag Me to Hell– The perfect date movie. Really! This was the first movie that Mark and I watched together, happy memories and a silly pseudo-horror movie. The Thing– Perfect Horror! The effects are great too (read: really gross and juicy), none of that new fangled computer generated business here! The Descent– A group of women go exploring in a cave. Creepy. Turn off the lights and be prepared to jump; and this is coming from someone who doesn’t usually jump during movies. Rebecca– Classic noir thriller from the master, Mr. Alfred Hitchcock. Who wouldn’t want to marry a millionaire with issues surrounding the accidental death of his first wife? Or was it murder?